DO-08006-06 was succesfully added to your cart. Usually ships in 13 days or sooner. temperature decreases—due to changes in liquid density. As temperature changes, the multi-colored balls rise and fall within the liquid-filled thermostatic tube. Lowest sphere in the top group within the instrument indicates ambient temperature. Can you have the bulbs all one color instead of multicolored? For example, all red, or all black? The bulbs are multicolored as the liquids each have a different mass. This is not available with all bulbs in a single color. My Galileo thermometer is made in Germany. Where are yours manufactured? Made in USA? This unit is made in China. Is the temperature marked in Celsius or in Fahrenheit? Which model is in Celsius? This beautiful piece of scientific equipment has tags dangling from the bottom of each float marked in F on one side and C on the other. A great way to start a good conversation. 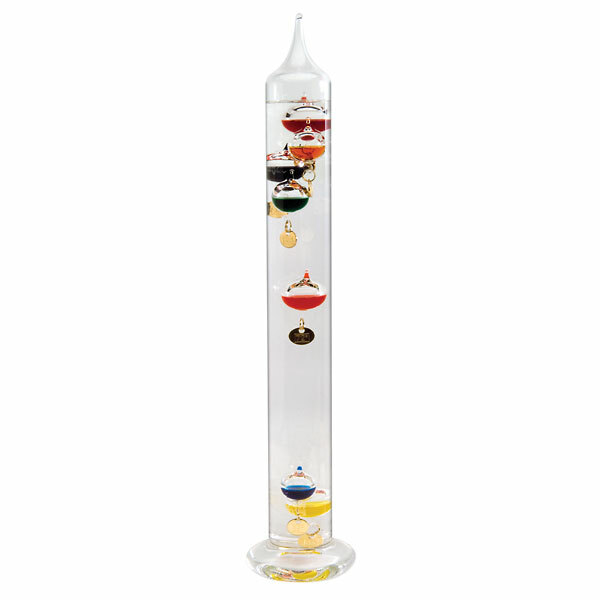 I've seen the Galileo Thermometer at stores like Marshall's & TJ Maxx. It appears as you can't 'open' it up to add more water. Is yours like that? If so, then how would the water be replaced after it evaporates? It is not filled with water. It is filled with an oily mixture and the glass is sealed. The liquid mixture will not evaporate. This Galileo Thermometer is sealed. Therefore it should not evaporate to need refilling. its a sealed vessel so theres nowhere for water to evaporate to.. Answered on 3/23/2013 by Dennis from East Leroy, Mi. This colorful thermometer is a great product and is a pleasant addition and talking piece to any home. This was a gift and arrived well packaged and in great shape. The help I received when ordering it was great. The recipient seemed thrilled and as far as I can tell it worked great. Product is used at home for enjoyment. Enjoy the colored globes moving accordingly to temperature. I am a Realtor and I bought one for a housewarming gift and one for myself. It looks awesome, the 2 degree scale is perfect for an indoor thermometer and the price can't be beat. I will likely order more. At two feet tall it makes a great den conversation piece. here. Turn the heat up! !!"